For a long time it was exactly the opposite: a big wardrobe was the hallmark of the haves and the have nots. Those with wardrobes bulging at the seams were those who lived a life of luxury. They were also often the rich. So for lots of people the desire for a wardrobe that contained every potential shoe and shirt combination became their desire, became a point of envy. But society has moved on. Daniel P Dykes is Fashionising.com’s Editor in Chief and Chairman. He set about creating a fashion publication that would go someway to being an arbiter on fashion as it appeals to the emerging power generations: those who don’t remember a world without the Internet and for whom work plays second fiddle to pleasure. And soFashionising.com was born as a publication for those who were focused not just on fashion’s trends, but on society’s too, and how those trends could all go to heighten the art of living. Over the past decade we experienced a change in the way we could consume fashion, one with an impact not seen since the days of the industrial revolution. It became quicker and easier to produce fashionable clothes and accessories than ever before. In fact, the fashion industry at all ends of the spectrum allowed it to happen. With fanfare the world’s big fashion houses showed their next collections six months in advance and the high street stores, imbued with new technology and able to understand every detail and trend that had been presented before the catwalk was even cold, were able to release it in mere weeks. The fact that so many shoppers readily bought what the high street offered up was not our fault. The industry model was and is broken. Broken to a point where it encouraged us – after all, why wait 6 months to invest in a look that you’re excited about now? There was a novelty to it all too. Fast fashion. Good looking fashion. Affordable fashion. Had we ever had it so good? But that novelty has worn off. The ability to access fast fashion has grown at a rate faster than Zara have been able to open their 1,700 stores. Comprehend that figure and add to it the an imaginary figure of just how many stores there are for other fast, fashion-foward brands such as H&M and you realise that fast fashion, and the dream of the massive wardrobe that it enabled with an affordable price tag, is now commonplace. It’s not just available to everyone, it is everyone. And a fashioniser – the world’s fashion forwards who make stylish socialising their hallmark and understand that fashion is a projection of where they’re going in life – never wants to be everyone. So the definition of luxury changes. Because luxury is always the opposite of commonality, in every facet of society. The working class poor could scarecly afford food, so the rich Edwardians were luxuriously fat. Processed and average quality food is now so accessible that organic and ‘pure’ foods, the polar opposite of what you find in the freezer isle and at takeaways, are now considered the luxury. Cheap food is now so accessible that waist lines have bulged and obesity has become an epidemic, thus it’s perceived by many to be a luxury to be slim. Across society luxury is defined by the polar opposites of what is most common and what those without a particular attribute, an attribute that is sometimes wealth but just as likely to be skill or knowledge, can have. So where does that leave fashion in an era where everyone can have a big wardrobe, where everyone can own too much, and they can do it cheaply? The new luxury is a small wardrobe. Not necessarily an expensive one nor one filled solely with goods from only the world’s leading fashion houses. These are defintions of luxury fashion past. The new luxury is now to be able to live and thrive with a small, pleasurable wardrobe. 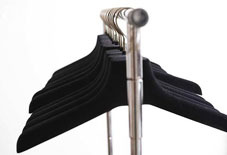 But a small wardrobe needn’t mean doing without. Anything but. It is in fact the hallmark of the modern fashioniser with their finger on the pulse. Or you can become a fan of Fashionising.com on Facebook to join in the conversation.